The FBI uses the news area of its website to post arrests, convictions, awards and requests for crime-solving tips. The most-viewed post of 2013, the bureau tells a journalism blogger, is a March 18 item offering a $5-million reward for help cracking a notorious 1990 art theft. The cold case is the two-man heist of 13 paintings from Boston’s Isabella Stewart Gardner Museum, including works by Rembrandt and Vermeer. Without specifying how many online visitors saw it in nine months, the bureau says the multimillion-dollar bounty announcement is this year’s most popular post. It was shared 2,857 times on Facebook and tweeted by 93 visitors to fbi.gov, stats on the site show. The multimedia post has a news release, videos in which two agents and others “discuss the case and their renewed efforts to recover the priceless art,” and a link for sending tips. 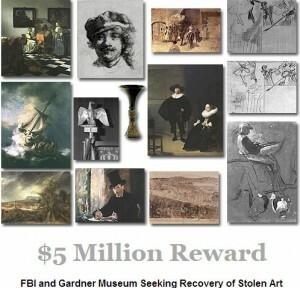 The hefty reward from the feds and the museum is posted “to get the attention of those who might have or know the whereabouts of the 13 stolen works of art,” the FBI says. Cleveland blogger Bill Lucey, an ex-newspaperman, contacted the FBI for a roundup headlined “Most Viewed News Stories of 2013.” The Boston case reward earns a spot Monday alongside coverage of Edward Snowden, the Boston Marathon bombing and May’s rescue of three Cleveland women held captive since 2002 and 2004. Posted: 12/17/13 at 12:49 AM under News Story.